At least two more children were mistakenly given an anti-cancer drug at Xinhua Hospital, a day after the hospital admitted it gave the drug to a four-year-old boy. 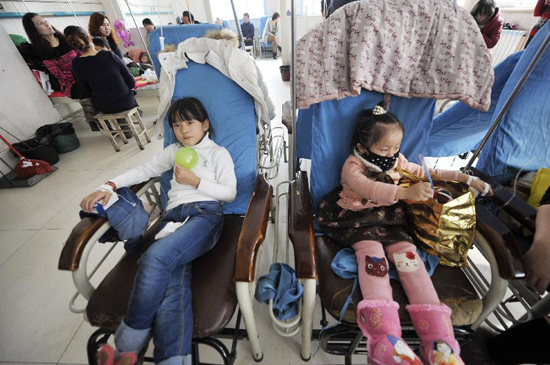 The two girls given the wrong medicine, cytarabine, had adverse reactions, including vomiting and fever, the parents told a Shanghai television station. The girls got the wrong drug at Xinhua's emergency department on December 4, the same day as it was given to the boy. All three children were supposed to get an anti-viral drug and all three were believed to have been prescribed the wrong drug by the same doctor, who was training at the hospital. The medicine they were given, cytarabine, is meant to treat acute leukemia and acute lymphoma. Its side effects can include injury to the body's blood cell production system, resulting in low white cell counts and low platelets. Hospital officials were not available for comment yesterday. The parents of both girls said the hospital had admitted the mistake and apologized. The parents said they were angry that the hospital didn't tell them until a week later. "When we questioned them about the delayed apology, they said they were afraid that the parents might lose control if informed of the bad news in a timely manner," the father of a four-year-old girl said. They also questioned the hospital's explanation, that the doctor picked the wrong drug because of a similar Chinese name from the medicine list in the computer, instead saying it appeared the doctor didn't know the effects of the medicine. "Because he also prescribed the anti-cancer medicine, a cytarabine injection, by handwriting on my child's medical record," said the father of an eight-year-old girl, who was sent to the hospital for mumps. The mother of the eight-year-old said the girl received 200 milligrams of intravenous injection and started to vomit and have fever after returning home. She was sent to another hospital, which found her white cell counts were in the lowest limit of normal. The quantity of the drug was what would be given an adult of 100 kilograms. The hospital said it had trouble finding the boy given the drug, but after tracking him down after 10 days, all his medical tests were normal.